Suffering an acute crisis of identity, feeling dejected because his newly found Hebrew brothers and sisters want little to do with him, and with a murder charge hanging over his head, the prophet Moses went on the lam for 40 years, during which time he got married and herded sheep for his father-in-law. 23During that long period, the king of Egypt died. The Israelites groaned in their slavery and cried out, and their cry for help because of their slavery went up to God. 24 God heard their groaning and he remembered his covenant with Abraham, with Isaac and with Jacob. 25 So God looked on the Israelites and was concerned about them. God needed an appropriate recruit to do his bidding. Someone who could effectively communicate with the new pharaoh, in his own language, knew the ways of the royal court, and had a Hebrew pedigree as well. Moses, being a fugitive, I suppose, was just a bonus for us, to show that God can use anyone, and manifest a new destiny for someone out of the worst situations. Moses met and got a first interview with “I AM THAT I AM” by way of a non-consuming wildfire—the Burning Bush. He reluctantly took on his marching orders, got Divine confirmation of his vision quest, then went back to Egypt with his cool walking stick, and connected with his biological brother, Aaron. After the death of the pharaoh’s son, the Hebrews, or Israelites, were allowed to leave—not on a long-weekend pass, as first requested, but were supposedly free to leave forever. Sidebar: Moses became the primary moving part of God’s will that resulted in extreme hardships and rejection of the people who for the first 40 years of his life were his kinsman. Isn’t it hard when you find yourself having to separate yourself from certain people, thinking you are doing God’s will? That could not have been easy for Moses either. But, of course, when he learned the true narrative of his people, he sought to bond with them. The grief-stricken pharaoh commanded his army to follow and corner the Israelites at the Red Sea (some say, it’s better translated in Hebrew, Reed Sea—Yam Suph—or Sea of Reeds, or Sea of Seaweed) and the waters (and/or reeds, and/or seaweed) parted, by the power of God, at Moses’ command, using his wooden staff. The Israelites passed through and the sea closed-in behind them, drowning the Egyptian Cavalry. 3 So all the people took off their earrings and brought them to Aaron. 4 He took what they handed him and made it into an idol cast in the shape of a calf, fashioning it with a tool. Then they said, “These are your gods, O Israel, who brought you up out of Egypt.” 5 When Aaron saw this, he built an altar in front of the calf and announced, “Tomorrow there will be a festival to the LORD.” 6 So the next day the people rose early and sacrificed burnt offerings and presented fellowship offerings. Afterward they sat down to eat and drink and got up to indulge in revelry. Meanwhile, our hero, Moses, who has no idea what his then-zany brother was up to, received the bad news directly from GNN—and, I must say, that “bull” especially did not go over well with Corporate. Weeeelllll, a deal with the Most High is on the table!!! Temp-ting! 11 But Moses sought the favor of the LORD his God. “O LORD,” he said, “why should your anger burn against your people, whom you brought out of Egypt with great power and a mighty hand? Look at our beloved Moses, standing up for the “stiff-necked” malcontents he had basically just met! 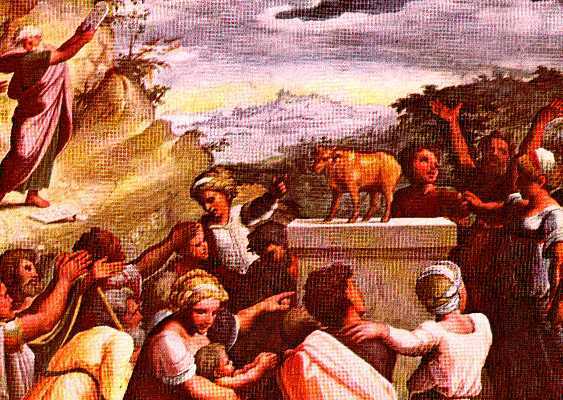 Let’s face it, Moses had been gone for 40 years, and had not gotten a glut of bar mitzvah invites before he left town. But he is a making a case—he’s making an argument to save his new family and friends! 12 Why should the Egyptians say, ‘It was with evil intent that he brought them out, to kill them in the mountains and to wipe them off the face of the earth’? Turn from your fierce anger; relent and do not bring disaster on your people. Could God be influenced by a cheeky threat of having a bad name on the rumor mill, in Egypt, a place He had just devastated? Could one actually cause God to change His mind? Had Moses struck a resonant chord with the Almighty? The indication is that “I AM” was/is quite keen on keeping his covenant promises! Moses heads back down the mountain, and that, in a big hurry. After having the sand to give God a memory jog, I would say Moses probably grabbed his sandals and high-stepped off that Holy ground at top speed, in his bare feet, if it were not for the fact of having two divinely inscribed tablets of stone in his hands. But now we learn God is not petty and that He is patient. When Moses climbed down the mountain, he broke the first two stone tablets in disgust with his people. The bible says those first tablets had writing on both sides, so there were likely more than Ten [original] Commandments, but God didn’t say a Word about Moses smashing His handiwork. But wait, back in verse 14 when it said that God “relented,” did that mean Moses caused God to change his mind, or, did God just delay executing His will? Good Heavens! We could do volumes on that passage of scripture. Did Moses just do that on his own?! Before God exacted his will, by Moses’ command, eventually purging the base camp of a select group of 3000 freaky-deaky, singing infidels, perhaps, Moses had passed a little test on that mountain, to see where his heart was. Maybe God wanted to see if Moses could be swayed by promises of self enlargement, as opposed to walking in the path of true leadership already laid out for him—to always work in the best interest of His people. I will leave it up to you to meditate on these things. What I do know for sure is that much later on, when Moses became frustrated and snippy with God by striking a rock twice with his staff, instead of just speaking to the rock to bring forth water, as he had been so instructed by God, his disobedience caused him to not enter into the “Promised Land,” after walking around in circles with His people in the wilderness for nearly 40 years (See The Book of Numbers Chapter 20). Things can go downhill, really quickly, if one is disobedient to God’s Word. The most compelling teachings I hear, these days, focus on instilling principles of love, peace, charity, obedience, scholarship (to study to show yourself approved), character, good stewardship, forgiveness and praying for God’s will to be done, not trying to corner God to enlarge our kingdoms for personal gain. Thank God, Jesus did not take the selfish route in the Garden of Gethsemane. Note to self: Apparently, if one has the favor of God, it’s just fine to remind Him of His covenant promises and fully expect to walk away in one piece, especially, if I am praying on the behalf of other people. Moreover, I believe I am an heir of the fulfillment of the covenant championed by Moses—with a provision for everlasting forgiveness and a bright future in eternity. (John 3:16). Smile. This entry was posted in Bible, Politics, Religion and tagged 40 years in the wilderness, Bible, Christian, Egypt, Golden Calf, Gospel, Jesus, Jesus Christ, Moses, Mt. Sinai, Pharaoh, Promise Land, Red Sea, Reed Sea, Ten Commandments, Wilderness. Bookmark the permalink. 27 Responses to Dear God, Please Stop — People Are Watching! Thank you for that message. Is it not thrilling to belong to our Lord yet a little scary when we upset Him but then true joy to know that He loves us and will be there for us? Amen! Thanks for the encouragement. I hope you all are safe and all are recovering well from the winter weather! Thank you and how cool: “The Song of Moses and Mariam” on your blog!! God Bless and thank you for the encouragement for taking the time to read and write! I truly enjoy your blog. Just found it today. An excellent and fit word. Please…more! More! Thank you! I love this. You are able to take that passage and turn it into gold. You have a gift, I can not wait to explore your thoughts. Thank you for finding me! Rob Akers, you old silver-tongued angel, thanks for the encouragement! I love your blog, and your flow, with no expectation of this distinct honor! God Bless! I have been called a lot of things in my life, but never silver-tounged angel. That is a honor. Thank you for the kind words. God Bless you and your family as well. You posed an interesting question when you wrofte, “But wait, back in verse 14 when it said that God “relented,” did that mean Moses caused God to change his mind, or, did God just delay executing His will? Great point. For example, God relented when the people of Nineveh repented and humbled themselves, but later (when they returned to their evil ways), God destroyed the city. I’m prone to think that in many cases, judgement is simply delayed. Thank your for your insights. Your writing is exceptional! I love your style. Blessings! Again, your encouragement is so appreciated. As this Christ-centered “evolution” my writing focus is just days old, in this iteration, and I feel a little isolated, because I was in a completely different world, just a very short time ago, with very different associates and as a director of the American Institute of Physics, just a few months ago. Jim, You are a brilliant writer. Thanks for stopping my my website. Hi Dorothy, you have wise 14 year old in your life. God Bless you both and your family. Thanks so much for the encouragement! To God be the Glory – great things he has done. Thank you so much for the encouragement! To God be the Glory and thanks for the encouragement! To God be they glory! You humble me. God Bless! Beautiful! I must say, your detailed narration of this, as though you were a witness to the experience of our big bro, Moses, is fascinating, to say the least. Exodus 5:1 indeed. How different history might be if pharaoh had simply granted the furlough?– Again God takes something intended to cause dis-ease and turns into a cure Thanks again! Your blogs could be a daily devotional…I like that they are situational, because it connects God’s word to what is happening today, thereby making it relevant. Thanks for stopping by my page, I might never have found your blog otherwise. Have a blessed day.. Your journey of thankfulness is an intriguing concept.Thanks the encouragement! God Bless! Moses teaches us that God makes His something out of our nothing. He doesn’t need us to do anything; He could do it better Himself. Yet He is pleased to use imperfect instruments to accomplish His perfect will. Praise His holy name! That’s my read too. Thanks for writing! God Bless! I really enjoyed reading this post! Excellent insight. Thanks for reading my blog! I appreciate the encouragement and glad you are back in the mix! God Bless!